This episode is sponsored by GotoAssist Express – try it free for 30 days. Adding extra content to a Gmail message just took another giant leap forward this past week with the introduction of two features. The first is Insert Invitation. This feature allows you to stay within Gmail to create a quick appointment and see what is on the other person’s Google calendar if they have it shared with you. This is much easier than the old “Add Appointment” link. Begin by composing a message and enter the recipients of your message. In my case, I’ll enter my wife’s email address which happens to be a hosted Gmail account and not a gmail.com address. She agreed to share her calendar with me a while ago, but if she wasn’t already setup for that, I would Click the calendar link at the top of Gmail, go to the Other Calendars section on the left, click the link “Add” in the lower right corner of that box and choose “Add friend’s calendar”, and enter her email address to send a request to share the calendar. She has the option of how much information and the amount of control I have, if any, on her calendar. Once she has shared her calendar, it will show up on the left in that Other Calendars section and her appointments will appear in the corresponding color. If you get too many other calendars you can simply click on the name of the calendar and it will turn them off . 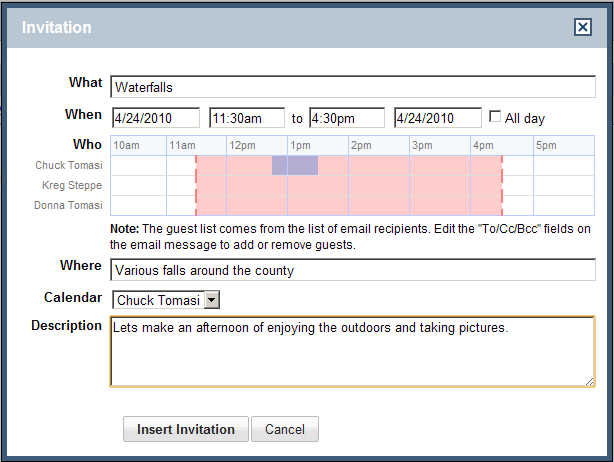 With the calendar displayed, let’s got back to Gmail’s Insert Invitation feature. With one or more recipients entered in the address field, I click the Insert Invitation link just below the Subject field and a window pops up with the subject filled in as the “What”. I pick the dates and times for the “When”, and just below that, Gmail displays the availability of all the email recipients who have shared their calendars with me. This makes it much easier to see conflicts and reschedule. While I don’t have too many calendars shared with my friends (yet), I suspect this will be a bigger benefit to companies and other organizations trying to schedule meetings. The other neat new feature doesn’t need much explanation. It’s a simple feature we’ve all come to expect from graphical computing over the last 25 years to drag items from one window to another. In some rare cases, even web applications allowÂ you to drag files from your local file system to a web application. Gmail offers the ability to attach files simply by dragging them from your desktop, or any other folder to the link that reads Attach a file. This feature currently only supported in FireFox 3.6 and Chrome, but Google promises to support drag and drop attachments in other browsers soon. One of the best features about Gmail is its powerful spam detection. Spam is that annoying email that you get from people or organizations you don’t know for products or services that you did not ask for. Some spam is easy to spot such as prescription medicines, or low loan rates. Others are more subtle and the spammers are getting trickier by masquerading as other popular websites such as Facebook and eBay. Recent assessments show that over 95% of all email on the Internet today is spam. If you are new to Gmail or just started an email address, you may not be receiving too much now. However, if you’ve had the same email address for a while and use it on other websites for registration, comments, or other ways to get information sent to you, you are opening yourself up to those people who will try to sell you something, known as spammers. Fortunately, Gmail stops a large percentage of these annoying email. However, no software is perfect and you may see a spam message in your inbox from time to time. You can simply delete the message which addresses the short term problem, but you run the risk of similar messages appearing again in the future. A better solution is to check one or more spam messages on the conversation index and click the Report Spam button at the top of the conversation index or just click the button if you have already opened a message to find out it is spam. If you have keyboard shortcuts enabled, you can use the hash (#) key. When you mark a message as spam, Gmail removes the message from your inbox and learns from the message you selected to prevent similar messages not only for you, but for all Gmail users. If you mistakingly clicked Report Spam on a message, you can click Undo at the top of the screen or use the same button which now reads Not Spam. If you have navigated away from the message you can use the the Spam folder on the left and locate your message. If you don’t see the Spam folder, try clicking “more” just above Contacts. Similar to spam messages are phishing messages (spelled with a ph instead of an f). These are messages where someone is trying to get you to login to their site so they can get your credentials for the real site. You can find out more about phishing from the Gmail Podcast released October 14, 2006. Gmail is full of so many features that sometimes I forget some of the best ones out there. One of those is the Move to button located on the button bar just above the conversation index and any conversation you open. The button works similar in both contexts. It is a combination of the label feature and archive feature rolled in to one. For more information on archiving and labeling, check the White Belt series Gmail Podcast website. To use the Move To button from the conversation index, select the conversation or conversations you want to affect then click the Move To button. A list of of your labels appear, much like the Label button. When you select one of these, the conversations you checked are immediately removed from the conversation index and archived with the label you selected. The Move To button behaves slightly differently if you are in the conversation reading mode. If you click on the Move To here, the same list of labels appears along with two options that let you move the message directly to spam and trash. These two options are identical to clicking the Spam or Delete buttons on the same button bar. Just like the mode from the conversation index, clicking any existing label will apply that label, archive that conversation, and take you back to the conversation index. Additionally, you can also create new labels from this mode, the same as using the Label feature. Because of the way the Move To button attaches one label and archives at the same time, makes it behave more like a traditional folder action than a Gmail label in that it files your conversation in a specific place with one label associated and it’s done. That’s not to say you couldn’t display the conversations with that label, locate your specific one, and attach more labels to it, but that would defeat the purpose of this specialized button. Sadly, I cannot find a shortcut key sequence to use this so I often use (the lower case letter) ‘l’ to bring up the label menu, label it, and type ‘y’ to archive it so fast I never think about the Move to feature. As useful as this button is, I rarely use it because it doesn’t have a shortcut key associated with it. Here’s a quick update… Google has improved the speed which popout windows appear. Popout windows are available when you are composing, replying, or forwarding messages, along with tasks, chat, and a few other places. For example, normally you see the chat window embedded in the bottom of your Gmail window. If you click the little upward arrow in the label bar with the person’s name, the chat window pops out of that browser window and becomes its own browser window. Previously this was a tedious few seconds. Now almost instantaneous. Thank you Google for continuing to improve our favorite mail program. This show is sponsored by Citrix GotoAssist Express. Try it free for 30 days. This episode is another in our getting started series with Gmail. This time I’ll cover a way to change the appearance of your Gmail interface without changing the functionality. Gmail calls these themes; other systems might call this “skinning” because you’re putting a new skin or motif to change the application’s cosmetics while leaving the underlying system the same. Changing your theme in Gmail is very simple and quite fun. Begin by logging in to your Gmail account then clicking on the Settings link in the upper right corner. Next, click the Themes tab on the settings window. When you click on one of the themes, Gmail will instantly change the look of your interface. There is no Save Changes button to click on this page. Try as many as you like or stick with the Classic look. You can even choose your own colors. Be selective with your theme and inspect all the various things on the conversation index and compose screens. You may find some things don’t contrast well. For example the light graphics at the top of the screen on the Phatasea theme makes it difficult to read the text “Show Search Options” and “Create a filter”. Some themes actually change throughout the day. You may be prompted to enter your location when you pick one of the themes. If you are very mobile, you can change your location at the bottom of the themes settings. These dynamic themes change to show the proper sunrise, sunset, and even weather conditions. Yes, I’ve seen it snow in Gmail! If you select one of these themes, you’ll see a drop-down menu appear asking for your country or region. Select the country you want, and then enter a city in the field provided. If you don’t enter a city, or enter an invalid one, Gmail will set your location to the capital city of the country you selected. When you’re done, click Save. One important footnote, Gmail Themes aren’t yet compatible with all browsers. Themes are only available in Internet Explorer 7.0+, Firefox 2.0+ or Safari 3.0+, and Google Chrome. If you’re using an older version of one of these browsers, you may run in to problems or not see the themes tab at all. Also, themes are not available if you host your own domain on Gmail. The hosting and themes have been out for quite some time, and I haven’t quite figured out why Google hasn’t added themes to this set of Gmail users yet. You can find more information about hosting your own domain on Gmail in the Gmail Podcast archives on the website. Quick update – Google has promoted six labs features to full Gmail features and removed five of them. Labs features are features in Gmail that allow you try out cool new things that Google is considering adding to Gmail. They may have errors and they may change, but most are useful to some degree. Again, more information on Labs can be found in the Gmail Podcast archives. This episode is another in our getting started series with Gmail. Creating and sending email may seem like an self-evident task with any email client. I want to ensure we cover everything to make you effective using Gmail. I’ll cover the basics to get beginners started and you Gmail veterans may still want to listen because I’ll throw in a few extras too. Let’s get started by logging in to your Gmail account at https://mail.google.com. In the future, I’ll assume you know how to do that, but since this is still one of the first getting started series, I want to make sure nothing is glossed over. On the left side, just under the Gmail logo, click the Compose Mail link. Next, enter your recipient’s email address in the To field. If you have a list of contacts setup, you can also start typing the name or address and Gmail will start auto populating the list. If you’re not sure how to spell the name, you can click the To: label and bring up the contact chooser to help narrow down your search. Don’t worry if you don’t have any contacts entered yet, there’s another show on setting up contacts that guides you through that simple process so you don’t have to remember and type an email address every time. Enter the subject of your message in the Subject text area, then click your mouse anywhere in the large text area on the screen to create the main body of your message and type away. As you type, Gmail will periodically save your message in the Drafts folder. In the event your browser or computer crash, you won’t lose all your work. Alternatively, you can also use the Save Now button at the top of your message. When you’ve completed your text, click the Send button just above the To field to have Gmail deliver your message. You’ll see a confirmation message at the top to let you know your email has been sent. Below the To field are two additional links labeled Add Cc and Add Bcc. Clicking each of these links presents an additional text area for you to enter additional recipients. These are used to include additional people or groups in your message. Cc stands for Carbon Copy. When you enter a recipient here, they are included in the message, however their email client may display the message slightly differently because the message was not directly to them, but rather they were a secondary recipient. Bcc stands for Blind Carbon Copy. Like Cc, you add one or more recipients in the Bcc field, but it has the added advantage that people in the To and Cc fields do not know who is in the Bcc field. An example of this may be that I want to send a message to Dave asking him to explain his behavior in the meeting yesterday, but I’d also like to include his boss Sally without letting Dave know that Sally is included. If I include Sally in the Bcc field, she receives a copy of the message I sent to Dave, but Dave doesn’t know that. Be aware, that some email systems, particularly corporate ones, may block email if your name is in the Bcc field so use it with caution. If you want to include a photo, document, or audio file, you can use the link labeled Attach a file just below the Subject field. Clicking this link presents a file browser that lets you navigate and choose a file to attach with your email message. When you’ve selected a file, click the Open button (on Windows machines) or Select (on a Mac) and your file will be uploaded to Google’s server and included as part of your message. If you want to remove the attachment before sending it, just uncheck the checkbox next to the attachment name. To attach more than one file, use the link Attach another file just below the list of file attachments. Gmail lets you attach up to 20 megabytes of attachments per message. If you have files larger than that, you should consider using another means of transferring your data. Finally, you can change the look and feel of your message by using the toolbar just above the message window. The various icons let you make your text bold, underlined, larger or smaller, change the font style, create lists, and more. As a general rule, don’t go overboard with colors and fonts or your text will be unappealing to the reader. Finally, l et’s say you’re in a bad mood or discovered the answer to the question you were starting to write in an email and don’t want to save it or send it, just click the Discard button above the To line, or at the bottom of the message window, to dispose of your work. That’s it. Creating basic and sophisticated messages is quite simple with Gmail. I no time you’ll be sending email without a second thought. This episode is sponsored by Citrix GotoAssist Express. Try it free for 30 days. This episode is the second in our Getting Started series on Gmail. I’ll walk you through the basics to setup your account.If you’re brand new to Gmail, you may want to go back and listen to the previous show on setting up an account. You can find it at the Gmail Podcast website, chuckchat.com/gmail, under the Getting Started page. If you’ve been using Gmail for a while, I recommend you still listen. You might hear something new. When you created your Gmail account, you provided a few items like your name, location, and a few other things. In this episode I’ll take deeper dive in to some of the other items you can configure. Begin by going to mail.google.com and logging in to your Gmail account. Next, click the Settings link in the upper right corner of your Gmail web page. The settings screen displays several links, or tabs, across the top. These are labeled General, Accounts and Import, Labels, Filters, Forwarding and POP/IMAP, Chat, Web Clips, Labs, Offline, and Themes. This show covers the General settings. I’ll go in to more detail for the other tabs in other Gmail Podcast episodes. The General tab includes the general settings to you account. The Language field allows you to set the language and character set used to display the Gmail application. This changes the menus, labels, and other aspects of the Gmail interface. If you get messages in French, this setting will not automatically translate them to English for example. Maximum page size sets the maximum number of conversations (or messages with the same subject) on a page. You can set this to 25, 50, or 100. The more messages you display, the more you can select without going to another page. However, too many messages and you may have to use the scroll bar on your browser. Keyboard shortcuts allows you to enable or disable the use of keyboard shortcuts in Gmail. Keyboard shortcuts allow you to save time by typing “c” for example, to compose a new message from the conversation index. These can be a real time saver. if you ever get confused, you can use the “?” key to show you the shortcut key help. External content determines whether or not Gmail will display images in your messages from trusted senders or prompt you each time. Since displaying messages can be a security issue, Gmail doesn’t simply display all images. If you’ve already sent messages to a person twice, they are considered a trusted sender and Gmail will display images from that person. Browser Connection: Security is important with Gmail. As a result, Gmail offers a secure connection using the HTTPS protocol. This is the default connection between your browser and the Gmail server. When you use HTTPS, the traffic on the Internet is encrypted. I recommend you keep this setting turned on unless you have a strong reason to leave your information unsecured. My Picture lets you upload an image that people see when you email or chat. Click the Select a picture link to get started uploading an image. Contacts’ pictures determines whether you are going to use the images that your contacts provided for themselves or only ones you uploaded as part of your contacts. The Signature option allows you to automatically place one or more lines of text at the end of each message you compose. To do this, change the radio button from No Signature to one with the text box. Place some text in the text box. This is what gets appended to your messages. Personal level indicators enables or disables little arrows next to the subject line of each conversation in the index. This is handy to know at a glance how the message was addressed. No arrow indicates it was a mass mailing. A single arrow indicates it was sent to you and others and a double arrow indicates it was sent only to you. The snippets setting tells Gmail whether you want to see the subject and the first part of the message in the conversation index or just the subject. How much of the snippet that’s dispayed depends on your video display and browser settings. By default, this is on. Are you heading on vacation or business trip and won’t be able to check your Gmail for a while? You may want to use the Vacation Responder option to send an automatic message to people trying to contact you to let them know you are out and when you will be able to respond. Outgoing message encoding tells Gmail what character set to use when sending your messages. In most cases, you won’t need to worry about this setting. However, if your recipient is having trouble reading your messages, you may want to set this to Unicode (UTF-8). Finally, the attachments setting lets you upload multiple files and see progress bars when you attach files to messages. The catch is, it requires Flash to be installed on your machine. If you’re not sure, head over to Adobe.com and download the latest Flash player for free. If you’re having problems with file attachments, try setting this to Basic Attachment Features and see how that goes. As a reminder, if you’ve changed any settings, click Save Changes at the bottom of the screen and you’ll be taken back to the conversation index with your new settings in effect. Subscribe to the podcast for free via iTunes to have the show automatically delivered, or watch the Gmail Podcast website for my next installment of the Getting Started series. Have you found yourself trying to send a message to someone and you cannot remember their last name? John? John? What was John’s last name? OK, John’s not your closest friend and you don’t send him email all the time. In fact, you don’t even know if you added him to your Gmail contacts, you may have only sent a message to his email address and never used his full name. You start typing j-o-h-n in the To: field and auto-complete comes up with the people who have John in their name and you don’t find the person you are looking for. Was he even in the hundreds of contacts you have listed? Now I have to admit, there are times when I would love to just browse my contacts list, or type a few characters, or even just poke around the contact groups I setup to get a better idea where John might be hiding. The latest update to Gmail answers this question. Google has placed a link on the “To”, “Cc”, and “Bcc” labels that bring up a contact chooser (see the image.) This works similar to the buttons next to the fields in Microsoft Outlook, only better. If you type in text in the area marked “Search my contacts”, Gmail will start filtering out your people. In my case, I typed “tomasi” and got several of my family members. Now I can just click and choose them. I can also narrow down the search to my groups by using the drop down list just below. This is a nice addition to the auto-complete feature if you’re really not sure how to spell someone’s name or want to quickly select all the Tomasis at once. “One of my computers is a netbook, so the space saving tips catch my ear. The “G” “L” combination to go to a label sounded like a great feature, but there is no drop down reminder. So I have to remember the name of the label. Thanks for the tip John. I generally use a dozen or so labels frequently; then there are some obscure ones that may go unused for months and I don’t recall their names or functions. Your suggestion seems to address that nicely. If you’ve got an tip about Gmail, send it along. I’d love to hear from you. That’s all for this time… Comments, suggestions, or questions can be sent to gpodcast@gmail.com or check the website for full information and archives of all previous Gmail tips at chuckchat.com/gmail. I have no affiliation with Google other than as a satisfied Gmail user. Thanks to you for listening, and don’t forget to write. This episode is sponsored by GotoAssist – try it free for 30 days. Have you ever wondered what to do with those messages that you get because you are on someone’s mail list? You don’t read them regularly (or at all), but you just don’t see a quick link, or you are not ambitious enough to unsubscribe. Well the geniouses at Google have an answer for that now too. The feature is called auto-unsubscribe. The feature is quite simple to use. Just open the message like you normally would, and click the “Report Spam” button. If the message is recognized as a mailing list, Gmail will present a popup window with an option to unsubscribe or identify the message as actual spam. The main difference is that marking it as spam won’t stop the sender from sending more messages in the future. If you click the option to unsubscribe, Gmail will send back an Unsubscribe request to the list. This request could take up to several days to process, but I found it to be pretty reliable. I read about this feature several weeks ago, but it took a while before it started working on my account. Here’s today’s quick tip… actually two tips regarding labels. The first is my recommendation to enable the labs feature called Goto Labels. Begin by enabling keyboard shortcuts in your general settings, then enable to labs feature Goto Labels. Now you can use the keyboard shortcut ‘g’ then ‘l’ (letter L) which brings up a quick popup window allowing you to type the label. Like addresses, quick typeahead is available. Using this, combined with the condensed screen options mentioned a few shows ago, this gives you rapid access to your labeled messages while maximizing your screen real estate. Which is very important if you have a smaller screen such as those found on netbook models of portable computers. The screen resolution of many netbooks is 1024×600 which can be a little constraining for people used to much higher resolutions on desktop or full size laptop machines. When you start applying and displaying one or more labels, you lose the effectiveness of the subject line. Fear not, there is a labs feature for this growing problem also. The feature is called “Hide Labels” and it allows you to turn off labels on the conversation index without affecting the functionality of the labels themselves, like the Goto Labels labs feature just mentioned. Now you can use your netbook and enjoy Gmail even more with the Hide Labels labs feature. Finally, it was discovered this week that Gmail has surpassed AOL mail and moved in to third place for online mail services with 37 million users, right behind Hotmail with 47 million, and Yahoo with a commanding lead 106 million unique visitors. That’s all for this time… Comments, suggestions, or questions can be sent to gpodcast@gmail.com or check the website for full information and archives of all previous Gmail tips at chuckchat.com/gmail. I have no affiliation with Google other than as a satisfied Gmail user. Special thanks to listener Scott Reynolds for his tip on the Goto Labels labs feature. Thanks to you for listening, and don’t forget to write. This show is sponsored by GotoAssist.com – try it FREE for 30 days! Gmail has made some significant changes to the way you label and store conversations. They have now made labels work more like folders in more conventional mail applications by adding drag-and-drop actions. Once again, Google has impressed me with their web programming savvy. Before getting started on the drag and drop feature, you should be aware that your labels have moved and are displayed a bit differently. Labels are no longer in their own little side window, but are now parked right underneath the standard system folders Inbox, Trash, Spam, and so on. You may also notice that all your labels are not displayed as they once were. Only the most used labels are displayed by default. If you don’t like this, click on the little down arrow just below the first few and click “Settings at the top of the new window. You can also get to this location by going in to Gmail Settings and click “Labels”. In this redesigned Labels settings screen, you can show or hide any number of the standard folders or your labels quickly and easily. Go ahead and give it a try. You could save yourself a lot of screen real estate. If you don’t like it, just turn them back on. I should point out that if you used the “Right Side Folders” labs feature, that it no longer functions. It is the first of the Gmail Labs features to be retired. A pity, I kind of liked having labels and chat on the right of the screen. OK, now that you’ve got your labels and folders displayed the way you like, it’s time to try that drag and drop feature. You can drag any conversation on to a label or any label on to a conversation. To grab the conversation, click on the dotted area just to the left of the checkbox. Your mouse may change to the shape of a hand with all fingers extended, as opposed to the standard link cursor with just the index finger pointed out. Once you have the message, continue to hold the mouse button and drag the message to the desire label. This moves the message to that label and archives it, effectively treating it like an operation of moving a message into a folder. If you would rather just apply a label and leave the message in the inbox, place your cursor over the desired label and click, then drag the label to the specific message shown on the conversation index. It’s really that simple. Remember, if the label you are looking for is not in the list, try the down arrow to show them all. I have to admit, I’m very impressed with this new way of doings from a developer’s perspective and I’m sure most of you use your mouse a lot to click on that checkbox, conversation, or label. However, I’ve found that I can still process messages many times faster with keyboard shortcuts, so aside from cleaning up my screen by hiding most of the labels and folders, I won’t be using drag and drop too much. If you’re not familiar with the keyboard shortcuts, have a listen to one of the first Gmail Podcasts I did in January 2006 to learn things like “l”, then start typing the first few letters of a label, or using “g” and “i” to go to the inbox quickly.